This program was funded by a grant from the Indiana Arts Commission and the National Endowment for the Arts. It brings together Denise's passion for music, history (she holds a Ph.D. in American History), and her dedication to peace and justice for the entire human family. When the power of music and the strength of the human spirit come together, the resulting force can tumble walls of oppression and open the way to justice, peace, and freedom. Throughout American history people have used songs to protest injustice, unite and empower those who suffer, and ignite people to action. hope and healing. Though drawn from the past, these songs offer valuable insight, hope, and inspiration to all those who are fighting for peace and justice in the world today. 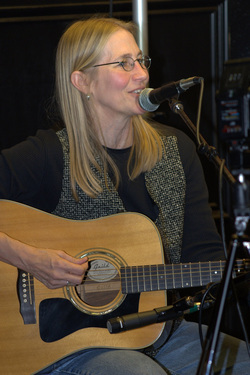 In addition to the historical voices, the program also includes original songs and songs from contemporary singer-songwriters who use their voices to advance peace and justice. In an information age which is replete with news of the injustice, greed and intolerance which separate people, these songs are a welcome reminder of the human capacity for compassion, sacrifice, and dedicated effort which will create a better world. Click here for a selected list of songs with descriptions."